Is that really the title? It looks like two random things mashed up together. Doesn’t make much sense, right? 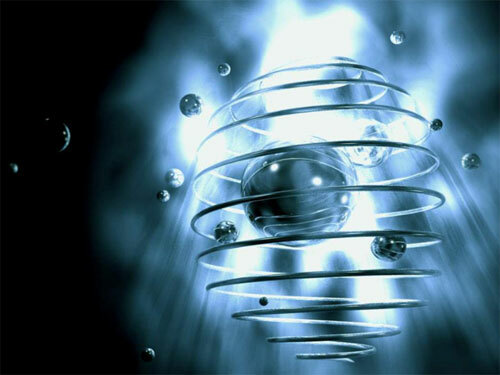 Well, recent research suggests that quantum encryption and black holes may be related. 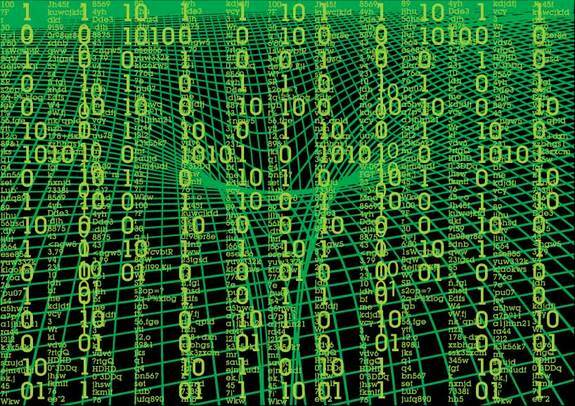 A proposed mathematical proof outlines the way in which information behaves in coded messages, and this may have implications for black holes. The proof basically suggests that the radiation spit out by black holes may retain information about them. The research not only focuses on encoding communications in quantum mechanical systems, but also addresses a long-standing question for theoretical physicists: What exactly happens to all the stuff that falls into a black hole? Is it possible to retrieve any information about the black hole? Before we start, what is a “black hole”? 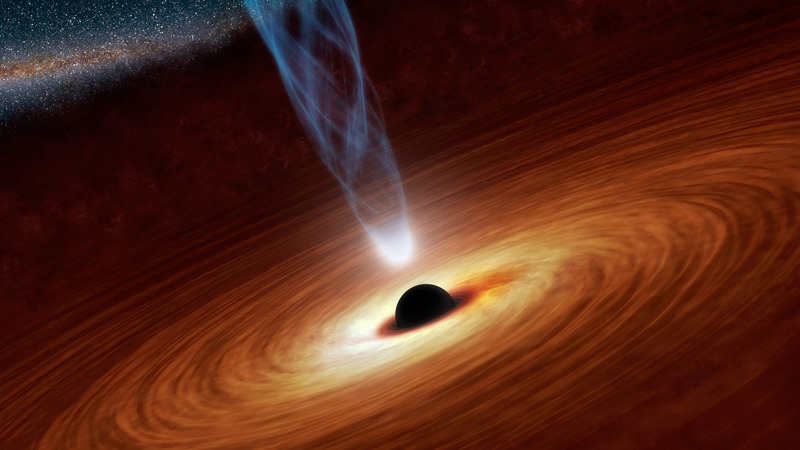 A black hole is a place in space where gravity pulls so much that even light can not get out. Imagine how strong the pull has to be for even light to be unable to escape! The gravity is so strong because matter has been squeezed into a tiny space. This actually happens when a star is dying. A star goes through various stages and then eventually becomes a black hole. Since no light can get out, people can’t see black holes. If you didn’t already know, humans are able to see things because light gets reflected from those objects and falls onto their eyes. Since light cannot escape black holes, we cannot see them. This actually makes them invisible. Even though we cannot see black holes, space telescopes with special tools can help us find them. The special tools can see how stars that are very close to black holes act differently than other stars. Black holes can be big or small. Scientists think that the smallest black holes are as small as just one atom. These black holes are very tiny but have the mass of a gigantic mountain. On the other end of the spectrum, we have stellar black holes. Their mass can be up to 20-30 times more than the mass of the sun. There may be many, many stellar black holes in our galaxy (The Milky Way). The largest black holes are called “supermassive.” These black holes have masses that are more than a million suns together. Okay, I get it! Now what is quantum encryption? Quantum cryptography describes the use of quantum mechanical effects, in particular quantum communication and quantum computation, to perform cryptographic tasks or to break cryptographic systems. Cryptography consists of both encryption and decryption. Well-known examples of quantum cryptography are the use of quantum communication to exchange a key securely, and the hypothetical use of quantum computers that would allow the breaking of various popular public-key encryption schemes. If we had a real functional quantum computer today, it would break all the security systems in the world. Luckily, we are pretty far away from having one such machine! The advantage of quantum cryptography lies in the fact that it allows the completion of various cryptographic tasks that are proven or conjectured to be impossible using only classical communication techniques. A lot of these techniques rely on the computational limitations of today’s machines. Brute-forcing anything would take trillions of years, even with all the computers in the world working in parallel. Quantum mechanics guarantees that measuring quantum data disturbs that data; this can be used to detect eavesdropping in quantum key distribution. Quantum encryption relies on the idea that any measurement made on subatomic particles changes the particles’ states. To understand this, let’s say you are given a closed box. The interior of the box changes color between red and blue randomly and you don’t know when or how it changes. Your job is to tell what that color is at any given point of time. Now, the very fact that you are opening the box may be one of the reasons for the change in color. You don’t know and you will never know what the color was at that instant! A similar idea is used in quantum mechanics. It says that the tiny sub-atomic particles are always in a state of uncertainty, until a measurement pushes the particle into one state or another. The upside to all this is that subatomic particles can be used as a “foolproof” key that allows only the intended party to decode an encoded message. In the world of secure communication, we try to encode the message in such a way that any attacker who gets hold of the message shouldn’t be able to decode it. If the attacker is sneaky, he will try to mask the fact that he tried to look at the message. So ideally, if we have such a sneaky attacker, we should be able to know if he tried to look at our message. In quantum communication, if anyone tries to decipher the message by eavesdropping, the two parties involved would know about it, and could change keys. That’s because any attempt to measure the key would change the information in it. Now that we have an understanding of black holes and quantum encryption, let’s see how they are connected in the next post. This entry was posted in Computing, Security and tagged Cryptography, Encryption, Hacking, Physics, Quantum by Prateek Joshi. Bookmark the permalink.